Be the first to know about all of the exciting announcements, discounts and deals we release in the run up to Christmas. Join The Handmade Christmas Co. community now. This Product is personalised. See a preview of your personalised product below. A non personalised design following the journey of the Christmas present. From the North Pole workshop, to under your tree. Measuring 80 x 53cm and complimented with one metre of branded crimson satin ribbon to tie round the top. The sacks are the perfect size and you sell many lovey Christmas designs. 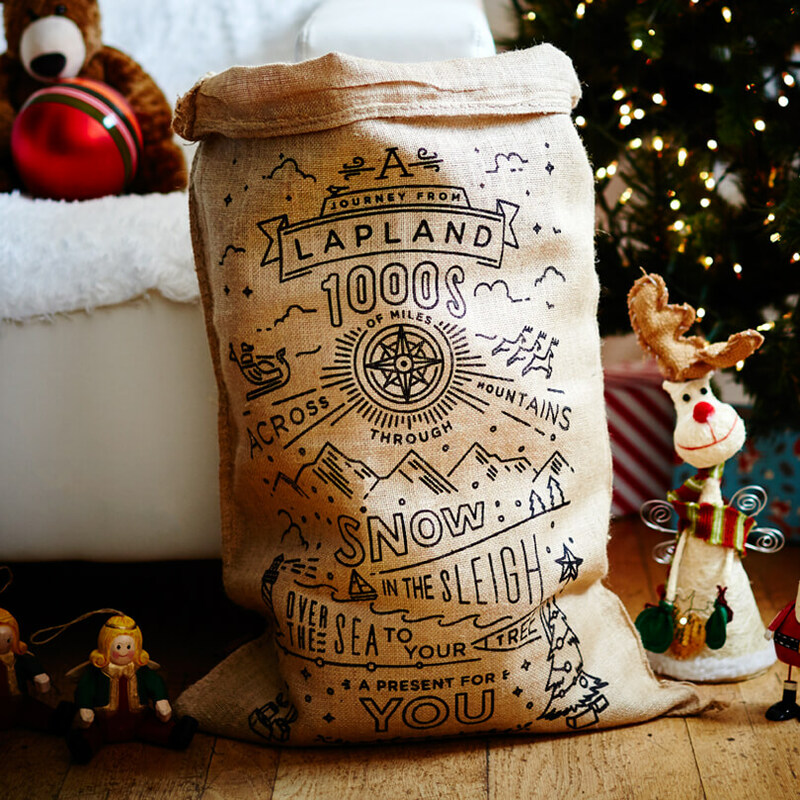 I got the ‘LAPLAND’ print sack which arrived in the post today and I am writing to let you know that you have a very happy customer. Lovely, great quality and looks just like the photo! Cant wait to give to my other half for christmas! Can’t beat this traditional looking sack!!! With locations across the UK, our products can always be found closer to home, personalised whilst you wait in-store. Find your nearest location.. The Handmade Christmas Co. was founded in 2012 to design a premium alternative to the traditional Christmas stocking. © Handmade Christmas Co 2017. A trading name of 36&5 Limited (Reg: 08938358) - 11, Cricket Lane, Beckenham, BR3 1LB, United Kingdom. All rights reserved.